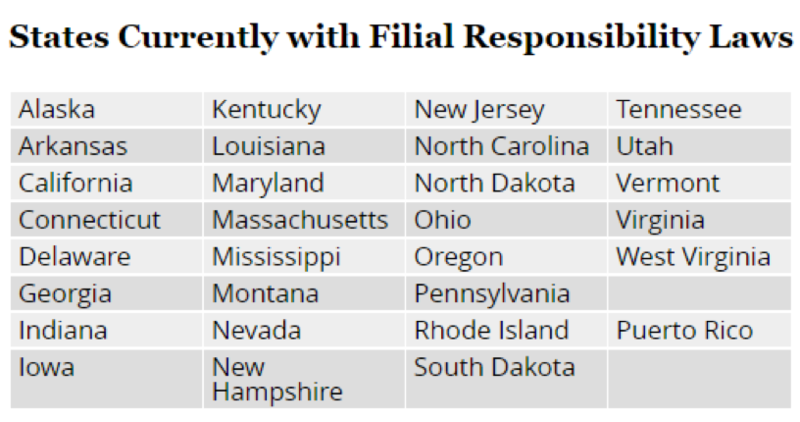 Did you know that most states currently have Filial Responsibility Laws that force adult children to pay for their parents nursing home care regardless of their personal relationship? Worse yet, adult children could be on the hook for medical expenses even after the parent passes. Filial Support Laws come from England’s 16th Century “Poor Laws”, a system of debt relief that stayed in existence until the modern welfare state developed. Make no mistake, this does not only affect the poor indigent, this applies across income classes. While we rarely see this law enforced in the states where it remains active, it is important to point out that in 2005 Pennsylvania re-instituted Filial responsibility and began enforcing it. When clients advise they do not believe an LTC event will occur and therefore, insurance is not necessary, the conversation must turn to “but what if it does”? Longevity is a very real risk. Fear of living too long and outliving your nest egg. Fear of having a long term care event and depleting your assets – while simultaneously relying on family to help out. Science and medical advances are keeping us alive longer than ever, but that also means we are more likely to need care at some point in our lives. In a worst case scenario, a client could pass away and leave a mountain of debt to their children. There are 29 states that can create this kind of medical debt for children once the parent is gone. LTC insurance is a way to guarantee the burden of care & financial responsibility is somewhat mitigated while also providing asset and income protection to the client. Do they live in this state? Do you plan to rely on them for assistance in later years? Do you have guaranteed lifetime income? I know this won’t happen, but if an LTC event did happen – how would it be paid for? What are the chances in a low-interest rate environment, poor economic state and election fears driving states to follow PA and reinstitute Filial Laws and prosecute under the law? Is it so farfetched? To learn more, chat with one of our LTC specialists today.